In this continued digest of job changes, I like to salute those that continue to join the industry in roles focused on social media, see the archives, which go back a few years. Vanessa	Sain-Dieguez joins Hilton as Worldwide	Social Media Strategist. She’ll guide Hilton Worldwide’s portfolio of brands and over 3,000 hotels in the development of social media strategies and best practices. Crowd Factory appoints Sanjay Dholakia as CEO. Hailing as the former CMO of Lithium Technology, Sanjay is now leading up this SF based Social Marketing platform. Cory Edwards joins Dell as the Senior Social Media Manager	Directing the social media team in Dell Corporate Communications. Adam	Boalt joins GOSO.com as President	Social Media Strategy. Brandon	Klein joins Ingenix Consulting (United Health Group) as Director of DesignShops & Collaboration	Arming all 1,000+ consultants with the best collaboration techniques (on and offline) while leveraging the latest innovations to improve the health care industry. Sarah	Molinari joins The Home Depot	Senior Manager, Social Media	Spearheading the social media efforts at The Home Depot. Mathew	Dryhurst joins Craigslist Foundation	Community Manager	Build & harness community around programs. RJ	Reimers joins 7Summits as Executive Vice President, Operations	As EVP-Operations, Reimers will focus on working with clients to develop and execute social media strategies that drive business value, as well as overseeing client service delivery and business operations for 7Summits. Marcia	Hansen joins Intel Corporation as Social Media Manager. Marcia is responsible for managing Intel’s consumer blog scoop.intel.com, and uses her creative talents to craft experiences for corporate and consumer audiences in social media. Glenn	Engler joins Digital Influence Group as Chief Executive Officer	Glenn will lead Digital Influence Group’s next growth phase. Digital Influence Group is a digital marketing agency that helps companies leverage the power of social media to generate business results: sell products and services, build customer relationships and connect with key stakeholders. Aronado	Placencia joins IncSlingers as Creative Strategist	Seek out new clients looking for real world application of Social Media. Shauna	Causey joins Ant’s Eye View as Senior Social Business Consultant	Shauna’s new role as Senior Consultant and Ant Evangelist will have her traveling up and down the West Coast adding her corporate communications and community relations experience to the team. She’ll join the firm officially on August 9 and begin immediately supporting the company’s growing roster of enterprise clients in the Silicon Valley area. Glenn	Engler joins Digital Influence Group as CEO	Glenn is tasked with taking the agency’s business to the next level of growth. Jonathan	Hsu joins RecycleBank as CEO	Hsu will work to introduce green rewards programs to eco-conscious brands, and roll out new product offerings for municipalities and partners innovate from a sustainability point of view. James	Davidson joins 7Summits	Vice President as Digital & Community Strategy	As VP Digital and Community Strategy at 7Summits. James will focus on developing and integrating social media strategies into clients’ existing digital initiatives and assets. 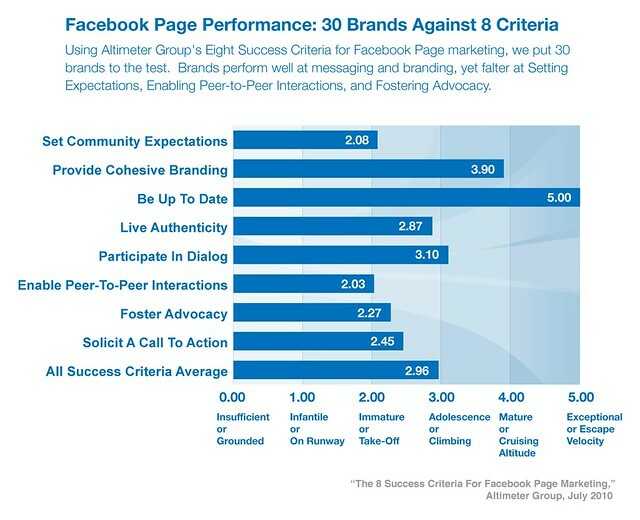 This is followup data from the Altimeter Report: The 8 Success Criteria For Facebook Page Marketing, you should read this first. Thanks to your help, Altimeter Group’s latest research on Facebook Marketing Best Practices, which now has over 17,000 views, and over 1,900 downloads (see slideshare stats) in less than a week. While we tried to include as much helpful information in the report, it was only the highlights of our findings. There’s far more data, scorecards, and findings that just aren’t able to fit into the report. Below is some additional information from our quantitative and qualitative study about the findings. Expect us to share more helpful data to marketers over the coming weeks, Altimeter clients can contact us for more details from the specific criteria, data, screenshots and scorecard. In the below graphic, we’ve aggregated the scores of the 30 brands to find out which of the criteria they’re good at –and which ones there are missed opportunities. We’ve then provided additional analysis on why we think brands scored this way, and some recommendations to improve. Set Community Expectations 2.08 (Immature or”Take off”) Brands failed to be clear why they were doing a Facebook effort, likely due to the fact that they jumped into the the social network bandwagon. Most brands are experimenting, and are unable to articulate their purpose Clearly have a business objective and be sure the site goals cascades these objectives. By not doing so, sets company up for a potential backlash as unchecked or unsolved customer woes can quickly cascade to their friends, on brands owns pages. Provide Cohesive Branding 3.90 (Adolescence or “Climbing”) Brands showed some sophistication from over a decade of online interactive marketing has taught them how to cascade their experience to all touch points This is a huge risk. Customer that have product complaints may echo them loudly here, and if the brand doesn’t respond, this public griping could escalate into a full blown groundswell. Continue to reflect the brand in all digital channels, but don’t overwhelm the member experience. Be Up To Date 5.00 (Exceptional or “Escape Velocity”) Brands have a strong legacy of broadcast marketing, which is also know as message bombardment. Brands demonstrated an incredible ability to propagate messages at a rapid rate, not unusual for other mediums as well. Continue this energy of being interactive with their customers, but in addition to populating the Facebook page with up to date updates, ensure they are engaging in a two-way dialog. Live Authenticity 2.87 (Immature or”Take off”) Brands suffered at being ‘social’ in a social network, and are in many cases afraid to show their human side. Decades of being logo centric has cascaded to social networks and most members may question having conversations with a logo. Behave in the same way the members are behaving: be social. Put the human side first by showing the team photos, giving human replies, and responding with first and last name. Participate in Dialog 3.10 (Adolescence or “Climbing”) Mixed bag of performance, while some brands may interact, often it was inconsistent. Even after a few years of social marketing blogging, forums, and Twitter, brands are still struggling to have real conversations with their members. Interact with customers by engaging in a two way conversation. To scale, you don’t need to respond to every message, but set expectations on how frequently you’ll respond. Enable Peer to Peer Interactions 2.03 (Immature or”Take off”) Poor performance from brands here. In many cases, we expect brands hid from these features as they are difficult to moderate, manage, and risk of conversations going awry. Better features are needed by using third party community applications, as well as hiring seasoned, well trained community managers to monitor and moderate. Foster Advocacy 2.27 (Immature or”Take off”) Brands are barely able to participate in the conversation let alone rely on the advanced features such as sharing or using your own members to share on your behalf. At the bare minimum, encourage members to share content with each other and to cascade the branded experience to friends. As brands gain confidence, create formal advocacy programs. Solicit a Call to Action 2.45 (Immature or”Take off”) Unsure of even interacting with their members, it’s no surprise they didn’t know how to engage them for next steps or even conversion. Don’t rush this. Until you’re scoring 4 or above on the previous mentioned criteria, I encourage brands to avoid this. Yet, for those that are succeeding in the other criteria, they can help members with conversion. Brands are applying their years of experience of applying interactive marketing and broadcast marketing to the social web and it shows. With the natural inclination to brand and broadcast, we see these same behaviors in the Facebook Marketing. Yet, despite these existing strengths, brands are missing the two way aspect or ‘social aspect’ of social network marketing. They must start to leverage peer to peer communications to reduce costs and content publication, show their human side, and quickly set expectations of what’s required –or risk a brand backlash. While setting community expectations doesn’t guarantee that a customer backlash could occur, it could help funnel them to the right place to be quickly supported. Yet, as problems are resolved, don’t shove them under the carpet in the call center, be sure to indicate back to the community they’ve been solved. Above all, brands must change their mindset from interactive marketing (human to computer) to also include social marketing (human to human).